While scrolling through the intertubes the other day, I came across a recipe for Mujadara on the herbivoracious site. 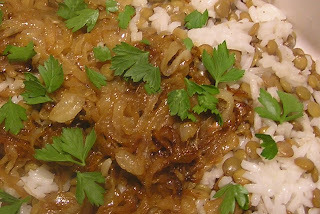 Mujadara is a classic middle eastern pilaf-type dish made with lentils, rice and caramelized onions. Even though this dish was new to me, according to the "Encyclopedia of Jewish Food" by Gil Marks, the first recorded recipe for mujadara was found in a 1226CE cookbook, and that recipe was based on a 9th century recipe. The term mujadara can be spelled a number of different ways since it is a transliteration from the Arabic word for smallpox, which the lentils kinda-sorta resemble. Before you go ewwww ... you know those vermicelli noodles you dined on last night? They are named after the Italian word for little worms. So there. Do you remember way back when you were a brownie or girl scout? This might be difficult if you are a male Dear Reader, but keep reading anyway. One easy recipe we learned to make was called a Walking Salad. My troop's version was a hollowed-out apple filled with a mixture of the chopped apple innards, raisins, celery, walnuts and mayo. The theory behind its quirky name was that we supposedly could carry and eat said salad while walking about or hiking in the local park. In reality, after a couple of bites most of the salad would spill out all over our hands or hit the ground to be eaten later by a lucky squirrel. This salad is more suited to breakfast. And to sitting, hence the even more quirky name. 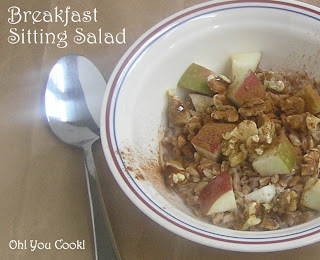 It's very easy to throw together, and you can vary the ingredients for a different breakfast every day. For example, I prefer to use walnuts in homage to the original recipe of my youth, but pretty much any of your favorite nuts can be used.